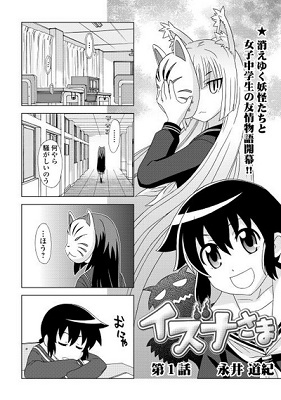 One day at school, Yoriko meets a girl in a fox mask, who it turns out is a goddess named Izuna-sama. Izuna's shrine is below the school, and she's come up to check out some troublesome artifact spirits. Yoriko ends up helping her, and a strange, new sort of school life begins for her! Yasaka Tokiwa lives in an unusual time, and according to his dreams, it's about to become even stranger. He's been having a dream of a woman called Ri'in ever since the robot, who he calls Makina, came to his home. He and Makina attend the same school, where their other classmates include a secret ninja (Kusanagi Kanata) and a sorcerer (Yata Haruka). When Tokiwa, the robot, the ninja, and the sorcerer rush to rescue the student council president from a demon, the boys find that they've all been having the same dream! What is going to happen to their world? Tokiwa Kitareri has already been picked up by the Spinyback Team for scanlation, and chapter 1 is out now! It's pretty funny, and has a lot of action. 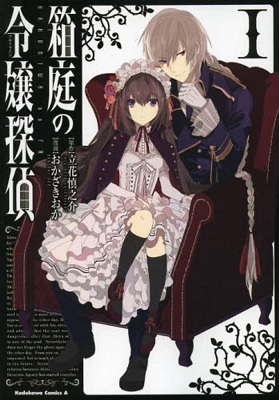 Hakoniwa no Reijou Tantei has some interesting stories so far, though the premise is nothing new. Izuna-sama is in a mostly 4-koma format, but seems to be a continuous story so far. Hakoniwa no Reijou Tantei - If you're a fan of the supernatural and like solving mysteries, then you'd probably like this manga so check it out. Izuna-sama - If you like manga in the 4-panel (4koma) format with a mix of school life and a goddess, then you may like this manga. 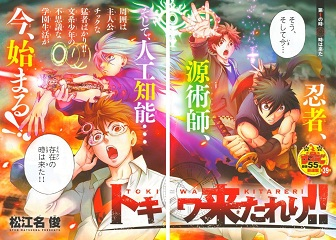 Tokiwa Kitareri!! - If you're looking for action with a smattering of comedy and ecchiness, then this may be the manga for you. Plus, the first chapter is already scanlated, so check it out.